Mary has completed her skincare plan, let’s review what her specific skincare plan entailed. Mary and her Esthetician decided that the Anti- Aging program would be the most ideal for her, considering her skin concerns and goals. This program was created to target two main concerns regarding aging skin, the toning and tightening of facial muscles under the skin and the plumping, smoothing and firming the surface skin. The two facials that create this program are the Age Summum Facial and The Lift Facial, both facials are performed twice during the duration of the program. The Age Summum works on firming of the surface skin, while plumping it up with a vigorous lifting massage, using Hyaluronic Acid and Vitamin C to provide a visibly-increased amount of tautness in the skin. Then, The Lift Facial focuses on stimulating the muscle tone of the face, highly concentrating on the muscles in the neck and around the mouth and eyes. The use of a micro-current is what provides the lift and stimulation to the muscles in the face. Mary has continued to receive compliments from family members and friends. Her husband was the first to notice right after her first facial in the program. Mary also found herself at a party, hosted by her sister-in-law, where her friends came up to her and said how well-rested she looked. “I would recommend this program to my friends who wanted to have a real improvement in their skin, and what they saw when they looked in the mirror. I personally would only recommend a skincare program to someone I am close with, close enough that I feel comfortable talking about signs of aging skin with.” We understand Mary, you can leave it to our Estheticians to talk to people about their aging skin, just point them in our direction after you get your compliments! Specifically for Mary, Suzanne would recommend a monthly facial to maintain her current skin condition. However she does suggest that Mary consider doing another skincare program in the Winter time. As the weather gets colder, the skin can tend to dry out, and a skincare program is a great way to combat that. Again Suzanne stresses that this suggestion is specifically for Mary. What type and the frequency of a skincare program will vary depending on the client and their individual needs. 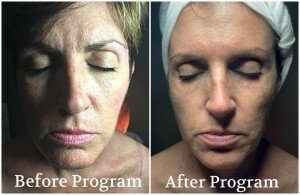 Let’s recap what we’ve done so far with Mary’s Skincare Program, she is currently completing the “Anti-Aging” Program. At this point, Mary has completed three of the four facials in her Skincare Program, two Age Summum Facials, one Lift Facial, and one Lift Facial, that will be completed next week. This is what we would expect at this half way point. Between her first two facials, and her at home care (you can see what products she’s using be checking out Week 2 of her skincare blog) she has basically been on a skincare workout routine. Although simply being on a skincare program will boost the skin’s health, having a good at-home routine as well, will not only boost any benefits received from the facials in the program, but will also prolong the results. The Age Summum and The Lift are the two facials that complete the Anti-Aging Skincare Program. They both combat signs of aging, but do so in two completely different ways. The Age Summum fights the aging process externally, while the Lift battles signs of aging internally. Let take a closer look at each of these facials and get Mary’s thoughts on each of them. The Age Summum is an anti-aging treatment that will help regenerate, firm, and restore the skin’s radiance. The exfoliation process helps to improve circulation, diminish fine lines and wrinkles and even out the skin’s tone. This treatment rejuvenates and brightens the skin for a more youthful glow. Mary expressed that she felt the Age Summum immediately made your skin fell lifted and tighter directly after the facial. Then after a few days, she noticed her skin continued to feel hydrated and was fuller and plumper. 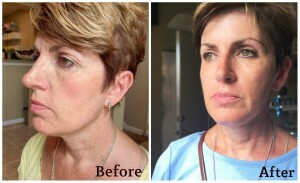 The Lift facial creates a natural, temporary “Face-Lift” effect by lifting facial features through muscle stimulation. The specific muscle-stimulation that this treatment uses, is called a micro-current. This current exerts a lifting effect on the facial features and oxygenate the skin. The Lift allows the skin to regain its tone and surface wrinkles to begin to fade. This facial is like “body building” for the face. Finally we are ready to introduce Guinot’s brand new Double Ionisation Hydradermie Facial to Fountains’ clients. For those of you who love the results with the original Hydradermie, get ready to be blown away with the new treatment. We are one of the first Spas in the USA to receive our Double Ionisation Hydradermie Machine. We are now offering two levels for all of our Hydradermie Facials. We will still offer the Original, Super and Ultra Hydradermie, however if you would like to enhance any of these facials, you can do so by requesting Double Ionisation. 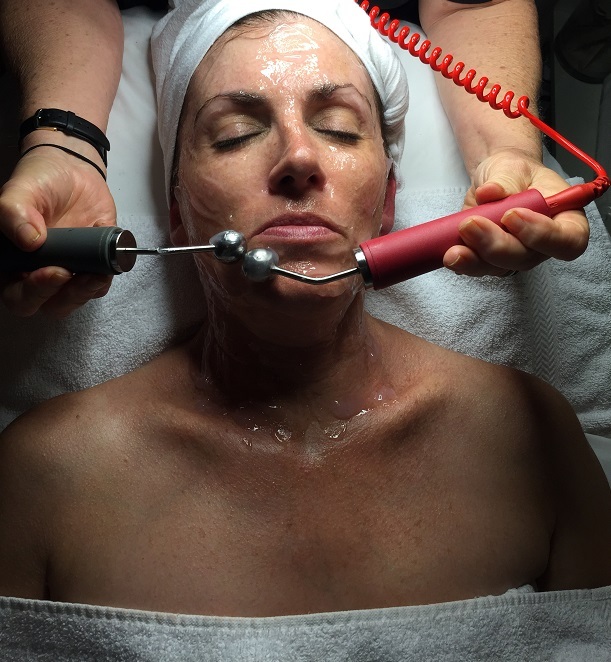 The Hydradermie is a facial that has been around for decades and our clients love it. A key factor of this facial is that it uses direct and indirect galvanic current. During the facial, your beauty therapist hands you the negative metal rod as they pass positively-charged rollers over your skin. The negative metal rod in your hand actually attracts and pulls the positive ions from the rollers deeper into your skin as they glide over the face. This process allows the active ingredients contained in the Guinot Gels to nourish and hydrate the dermis and epidermis (outer layer) at the same time relaxing the tiny muscle that holds the pore closed enabling the therapist to perform extractions with ease. Once the skin has been deep cleansed the second and very important part of the facial begins. With the skin clean and the pores open we bathe the skin in oxygen, giving life to the cells. This part is so important no matter the age or skin type. A relaxing facial massage is given before the final step, the individual face mask chosen for your skin type. With Double Ionisation the effect of the current is dispersed directly on the surface of the skin, sending the super food gels (rich in calcium potassium and algae minerals) deeper into the skin, providing you with greater longer lasting results. The Double Ionisation Hydradermie will take the same amount of time as the Hydradermie, however there is no longer a need to hold the negative metal rod. Instead of the client holding it, in the new treatment the Esthetician holds both the positive and negative currents in their hand and use them both simultaneously directly on the skin. By having both the negative and positive electrodes pass over the skin at the same time (Double Ionisation) the client is receiving double the benefits, compared to the standard Hydradermie. The positive current helps the nutrients of the treatment gels to go further into the skin, while the negative current is pulling impurities out. The treatment gels that are used during the facial are formulated to deliver deeper nutrients to the core cells, thus increasing the lifespan of that cell while also aiding the negative current to pull out impurities at the same time, making pore cleansing more effective. Compared to the results or the original Hydradermie, the Double Ionization provides more visible and longer lasting results. The Double Ionisation reaches deeper, enabling the gels to perform more effectively than ever before. Bringing your skin instant radiance as well as hydration. Since the gels are penetrating deeper into the skin, the core cell’s life span and productivity are increased, in other words, you skin cell will live longer and become stronger. I really am excited to have you experience the new double ionization hydradermie and see for yourself what a difference just one treatment makes. I often note that some of the key enemies of the skin and factors that accelerate the aging process include several “s-words” — smoking, sun, stress, sugar, and inadequate sleep. Today we’re going to focus on what kind of damage excessive sugar causes, and what can be done to minimize it. Ingesting excess sugar causes a process known as glycation (glie-KAY-shun) to occur. This is where sugar molecules attach to proteins, which basically weakens them and diminishes their ability to function properly. The two key proteins that we’re concerned about are collagen and elastin–the support structure that keeps young skin firm and flexible. As we age, the strength and density of collagen and elastin diminishes. Naturally, our goals in skin care are to slow the aging process, and create a healthy environment for the skin’s cells, tissues and anti-glycation measures should always be considered when setting our anti-aging strategy. What dietary courses of action can we take to minimize glycation and it’s harmful effects? Decreasing our sugar intake –especially the more harmful white sugar and high fructose corn syrup contained in so many processed foods–is a good place to start. I’m happy to say that I kicked the “twizzler, gummy bear, and neon gummy-worm habit” several years ago, resulting in increased energy and improved sleep. Carbohydrates, while needed by the body as a source of energy is converted into sugar. A healthy approach to carbohydrates is eat more of the good carbs –fruits, vegetables, whole grains — and avoid or decrease the bad ones such as candy, soda, and sugary cereals. The good carbs contain less sugar which is introduced to your system more slowly. We’re always advising skin care clients that diet affects the skin –glycation is one of many reasons to improve our diets. Skin care, at the spa and in the home can fight glycation. Regular infusions of anti-glycation agents, particularly those found in Guinot’s “Cellular Life Complex” strengthen and energize the cells and tissues, making them less vulnerable and setting the stage for more effective collagen synthesis. When we’re in our 20’s our metabolism is more active, stronger, and fights the effects of glycation more effectively. As we age, energy and regeneration slows down — making it necessary to step up our anti-aging (anti-glycation) efforts. These more potent anti-glycation ingredients can be found in Guinot skin care products, including Age Logic Celllulaire Cream, Time Logic Age Serum, Pleine Vie, and Douceur de Vie SPF 15. In the spa, our facial treatments are designed to provide a deep infusion and higher concentrations of these anti-glycation agents. The world famous Hydradermie Facial does this by utilizing two types of electric current — galvanic and high frequency– to both ionize and oxygenate, resulting in immediate visible and lasting results. Regular facials make the skin more receptive to your home care regimen, and good home care makes our facials more effective. In summary, glycation is only one of the many factors that can accelerate the aging process. While glycation can never be eliminated, diet and specialized skin care can minimize its negative effects. Other factors can’t be ignored, especially lifestyle habits: exposure to the sun, smoking, inadequate sleep, and the effects of stress. These can all result in oxidation which produces a chain reaction of free radicals, making the components of our skin more vulnerable and ultimately causing it to age faster. Common sense proactive measures –avoid smoking, minimize sun exposure and the use of sunblock, and regular vigorous aerobic exercise to manage stress and stimulate the metabolism — are all necessary to maximize our anti-aging efforts. Going away this summer? We’ve got new travel size products for all your vacation essentials. Our refreshing milk cleanser and toner, Lait Hydra Fraicheur and Lotion Hydra Fraicheur are great for all skin types. With Aloe Vera as the main ingredient, this combo helps calm and hydrate your skin after air travel or sun exposure. The milky gel-like texture also makes it great for gently removing makeup. Following up with the refreshing toner to remove any makeup and cleanser residue will leave the skin feeling fresh and clean. Summer is a great time to indulge your skin, I like doing this with a mask. Guinot has three travel size masks, and they are all amazing. The Anti Fatigue Mask is great for perking up and brightening dull skin, especially during and after flying. It contains cold essential oils such as eucalyptus and mint to refresh and bring your skin back to life. Mask Hydra Beaute is also a wonderful mask. If you have dry or dehydrated skin, this mask will bathe your skin in relaxing moisture, giving you back your summer glow. 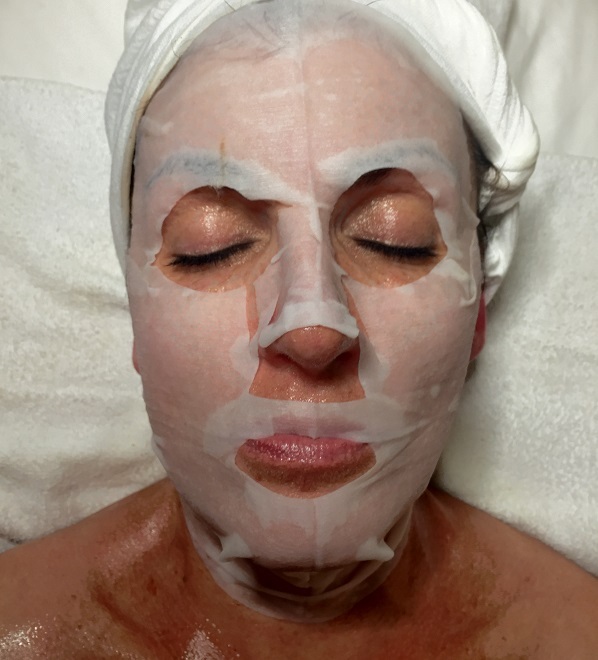 The last travel mask that Guinot has is Mask Vital Antirides, this is ideal for mature skin. It erases signs of fatigue and reinforces skin elasticity. The Longue Vie Mains is a great hand cream to keep in your purse or car. It makes your hands feel smooth and moisturized, but never greasy. It also helps with fading mild hyper pigmentation on the backs of hands, cause no one wants sun spots. Our Creme Hydra Beaute is a very moisturizing yet light cream. It’s perfect for summer weather since it doesn’t feel like you have a heavy layer of moisturizer on your face. Hydra Tendre cleansing cream is one of our most popular cleansers, and my personal favorite at the moment. It makes so much sense for this to come in a travel size. This cleanser is gentle yet works wonders for skin that gets oily in the summertime. With the main active ingredient being Aloe Vera Extract it leaves skin feeling revived and refreshed. One important thing to remember is the summer is to exfoliate your skin on a weekly basis. Between makeup and moisturizers, sunscreen and pollution, your skin has a lot built up on the surface. For those of you who have sensitive skin or don’t like the traditional grainy exfoliators, try the Gommage Biologique. This is an exfoliating peeling gel that helps remove dead skin cells with AHAs. If you’re more into traditional grainy exfoliators, then check out Gommage Grain, it has microspheres that gently eliminates dead skin cells while smoothing and refining skin’s texture. My name is Danielle, and I wanted to share my daily skincare routine with you. First I’ll give you a little background information about me. I am originally from Maryland, but before moving back, I lived in Florida for 4 years. During my time there, I did what any Floridian does, I soaked up the Sun, which resulted in many sunburns. I cringe now just thinking about it. Eventually I wised up about how bad Sun damage was for my skin and quit the long days at the beach and started applying SPF. I initially was interested in becoming a makeup artist. I was always doing makeup for my friends and family for events or dates. I wanted to become certified and began looking up makeup artist programs. During my search to become certified I started to discover Esthetics and began to develop a strong interest in it. One thing led to another and I became a licensed Esthetician, and have fallen in love with skincare. As a person with dry skin, this harsh winter has done a number on it. My skin was not only dry but flakey all over, and was in much need for some nourishment. The cleanser I’m using at the moment is the Lait Hyrda Confort cleansing milk. I absolutely love this cleanser, it takes off all of my makeup, makes my skin actually feel smooth, and did I mention it smells so good. This cleansing milk contains Shea Oil which leaves my skin feel so soft and healthy. It also contains Cornflower extracts, this helps to soothe my skin. The way I use it is by pumping 2-4 pumps in my hands and work the cleanser around my dry face. I apply the milk to dry skin because it is an emollient, which helps to breakdown any dirt, oil or makeup that I have on my skin. Then I simply rinse the cleansing milk off with warm water and a shammy (a type of washcloth). After cleansing my face, I apply a moisturizer. The moisturizers I use differs from day to night. In the morning I use BiOxygene cream. I find that it provides my skin with hydration without being too heavy. I apply BiOxygene just before I put on my makeup. It’s hydrating enough to give my makeup long staying power, and light enough to keep my makeup from slipping off my face. Lastly, the smell of this cream is divine, very fresh and clean. Because my skin has been recovering from the cold, to give it an added boost of nourishment, I have been apply Creme Nutrition Confort after I cleanse my skin at night. This cream is filled with essential oils, such as, Lavender, Rosemary and Thyme. These oils help repair and nourish very dry skin. This is a cream that I’m using to treat my dry skin, as the weather warms up and my skin balances out I may replace this moisturizer with BiOxygene, but for the time being this is a necessary product for me. If anyone has any questions about any of the products I use, or if you are interested in having a skin consultation and facial, just stop by the spa, I’m always happy to meet new people.